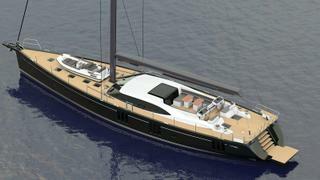 British yard Oyster Yachts has revealed its newest design, a 27.12 metre sloop-rigged sailing yacht called Oyster 895. Developed in collaboration with Rob Humphreys Yacht Design, the Oyster 895 is based on the same hull as the outgoing Oyster 885, which has spawned ten hulls. The new arrival features a slightly longer LOA and a redesigned deck layout, but the 6.33 metre beam and 3.46 metre standard draught are unaltered. However, the main difference can be found in the systems upgrades and more centralised weight distribution, which will bring the yard’s 27 metre offering more in line with its flagship Oyster 118 series. A wide range of layouts will be made available with accommodation for up to eight guests split across four cabins, including a full-beam owner’s cabin aft, two doubles and a twin. Alternatively, the double cabins can be removed to make room for a larger owner’s suite and additional lounge seating. Whichever layout option is selected, the Oyster 895 will feature two crew cabins in the bow for a maximum staff of four people. Key features include a fold-out swim platform built into the transom, foredeck tender storage space and a C-shaped cockpit that would be ideal for enjoying a light meal al fresco. 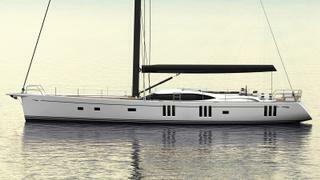 Oyster yachts are renowned for their bluewater sailing capabilities and this will be backed up by a new lower-revving 330hp Cummins QSL9 engine that will allow for economical cruising at nine knots and a maximum range of 3,000 nautical miles, drawing on a total fuel capacity of 3,500 litres. Other superyacht projects currently under development at the British yard include the Oyster 835, which is a similar revamp of the outgoing Oyster 825 design, of which seven have been built.